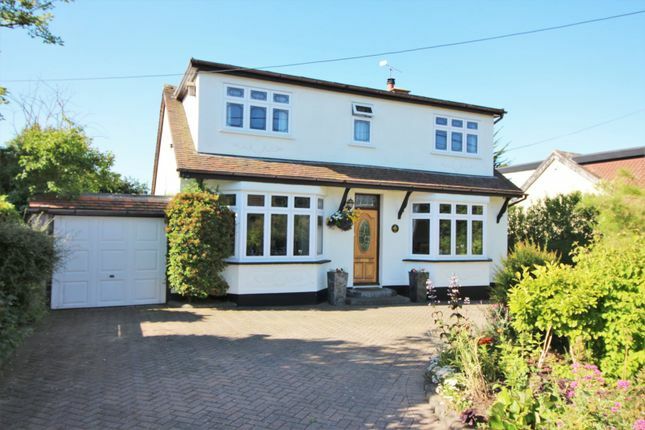 This is a spacious and well appointed detached home set over two floors. The property has four bedrooms and a shower room upstairs and on the ground floor there is a large lounge, a formal dining room and a third room that can be used as a fifth bedroom or additional reception room as required. There is also a fitted kitchen, ground floor bathroom and a utility room. The property has a dual zone fitted alarm system and CCTV plus smart meter. The property has a stunning mature rear garden and a superb in / out driveway and garage which makes the property ideal for larger families. Positioned centrally between Rayleigh and Benfleet stations the property has good rail links to London on either the Liverpool Street or Fenchuch Street lines. There is also easy road access to the A127 or A13 for an easy road commute to London and Southend. French doors to rear . Carpet. Two radiators. Window to side. Brick fireplace with log burner. Bay window to front. Laminate floor. Radiator. Coved cornice. 12'2 x 10'1 Bay window to front. Built in custom built shelving and storage. Carpet. Radiator. Window to rear. Range of built in units. Inset induction hob and double electric oven. Under floor heating. Ceramic tiled walls. Ceramic sink unit. Integrated dishwasher. Window to rear. Corner bath. Hand basin. Low level W.C. Heated towel rail. Door to garden and window to rear. Range of fitted units. Plumbing for appliances. Double glazed windows. Built in wardrobes. Radiator. Carpet. Double glazed window. Radiator. Carpet. Built in wardrobe. Double glazed window. Carpet. Radiator. Window to rear. Shower cubicle. Hand basin. W.C. Ceramic tiled walls and floor. A superb mature rear garden with a selection of landscaped areas including lawns and shrub beds. Ornamental pond and patios. Two sheds and a greenhouse are to remain and at the rear a bespoke growing frame with netting which can remain if required. Note: The bottom 50ft of garden is used under a lease costing £100 per year from the school at the rear. The property has a sweeping carriage driveway with dual in / out access which provides considerable private off road parking. Property descriptions and related information displayed on this page, with the exclusion of Running Costs data, are marketing materials provided by Purplebricks, Head Office, and do not constitute property particulars. Please contact Purplebricks, Head Office for full details and further information. The Running Costs data displayed on this page are provided by PrimeLocation to give an indication of potential running costs based on various data sources. PrimeLocation does not warrant or accept any responsibility for the accuracy or completeness of the property descriptions, related information or Running Costs data provided here.